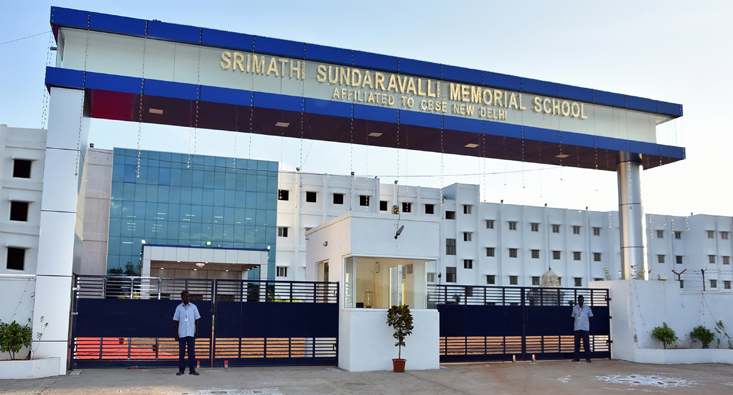 Srimathi Sundaravalli Memorial School was inaugurated on 15th June 2012, by the Honourable Justice, Sri.M. Karpagavinayagam, Chairperson Appellate Tribunal for Electricity, NewDelhi. Our school has Secondary School affiliation with the Central Board of Secondary Education, New Delhi, vide Affiliation No. 1930487. The strength of the school from classes JM1 to VII on the day of inauguration was 2213. Classes VIII and IX were added in the subsequent years, at one class per year. The first batch of class X students will appear for the Board examination in March 2016. The school will be upgraded to Senior Secondary level in the academic year 2016 -17 and the first batch of class XII students will appear for the Board examination in March 2018. The school has the state-of-the-art, world-class comforts. The luxurious, educative infrastructure available in the school is narrated under the respective headings, elsewhere in this book. The following academic hierarchy serves the students to the fullest satisfaction of the parents. The Principal of the Senior Secondary division will be the Head of the Institution. The following support departments headed by responsible officers, offer the best service to the students and parents for the smooth functioning of the school. The Educational Officer is the Management Head and the Controlling Authority of the Institution. The Teacher – Student ratio of 1:18 in the academic domain and gross Staff - Student ratio of 1:11 is the best feature in our school, in the Indian educational scenario. The school has many laudable plans to achieve in the years to come. With the blessings of God and the co-operation of staff and parents, the school will continue to serve the students for their prosperous life.